Uber's chief executive could be forced to take a leave of absence under changes being considered by the firm, reports say. 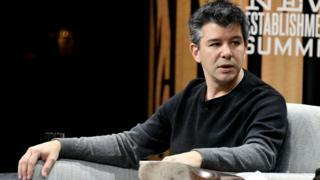 The company's board met on Sunday but has not released any details on Mr Kalanick's future yet. The board also voted on a review of its policies and corporate culture by former US Attorney General Eric Holder. The review was instigated in February after former Uber engineer Susan Fowler made claims of sexual harassment. Uber confirmed to the BBC that "the board unanimously voted to adopt all the recommendations of the Holder Report. The recommendations will be released to the employees on Tuesday." It has not been confirmed what those recommendations are. It is possible that Mr Kalanick could take time off from Uber and then return to a role with less authority, or remain as chief executive but face more scrutiny, the Reuters news agency reported. The New York Times reported that one of Mr Holder's recommendations was that Emil Michael, Uber's senior vice-president of business and a close confidant of Mr Kalanick, should leave the company. The board meeting comes just days after Uber said it had fired more than 20 people, and was taking other actions against staff, for issues including sexual harassment and bullying. Last week Uber's finance chief, Gautam Gupta, said he was leaving, following New York general manager, Josh Mohrer, and the head of Uber's self-driving unit, Anthony Levandowski, out of the door. Mr Kalanick has earned a reputation as an abrasive leader and was criticised earlier this year after being caught on video berating an Uber driver. He said in response to the video: "I must fundamentally change as a leader and grow up." Uber board member Arianna Huffington said in March that Mr Kalanick needed to change his leadership style from that of a "scrappy entrepreneur" to be more like a "leader of a major global company". The board has been seeking to recruit a chief operating officer to assist the chief executive. Some investors are concerned at the power Mr Kalanick has over Uber because of the number of voting shares he controls. San Francisco-based Uber is valued at nearly $70bn (£55bn) but is yet to make a profit.